The following routing instructions apply only to vendors that have been pre-approved for collect freight terms. Authorized freight collect vendors MUST ship via carriers approved by URBN. You will be charged back if you are in violation of these guidelines. Shipments that range from 1-150 lbs. should ship via UPS directly to final destination DC as indicated on your PO and packing list. Contained below in this document are detailed instructions for all heavier shipments. UPS account number can be requested from inboundrr@urbanout.com. Performance Team is the carrier & consolidator that is to be used for all freight collect shipments 151 to 9,999 lbs. originating in the Los Angeles CA commercial zone (ONLY for shipping origin zip codes 900-928, 930-931). Vendors are now required to register with Performance Team by logging into their Website and using the Performance Team Vendor Portal Scheduler to arrange pick up. Details and instructions are listed in section # 4 below. This change only applies to shipments weighing 151 – 9,999 lbs. originating in the Los Angeles Commercial zone as shown below. The Bill of Lading (BOL) must be marked as Third Party Collect and must meet requirements laid out in BOL instructions (below). Billing to: Urban Outfitters, 755 Brackbill Road, Gap, PA 17527. We will not authorize prepay & add-on vendor invoices. Parcel shipments must specify “Urban Outfitters” on the label, and be classified as 3rd-party, bill-to: 755 Brackbill Road, Gap, PA 17527. Do NOT purchase additional insurance from carriers. Any expense for additional insurance will be charged back to the vendor. All air freight shipments must have buyer authorization. Contact InboundRR@urbanout.comfor routing instructions. Max free time for TL (Truckload) shipment pickup is 2 hours. Any detention costs incurred at pickup will be charged back to the vendor. All Furniture vendors must determine their shipping needs. Palletized and shrink wrapped production pieces will ship via LTL as listed in your geographic area. Custom Furniture and blanket wrapped furniture must ship via L&J. Email shipment information to URBNFurniture@ljmoving.net and inboundrr@urbanout.com. A VICS Standard Bill of Lading (sample shown below) is required for all domestic TL (Truckload) or LTL (Less than Truckload) shipments. The following information must be legible and included on the carrier’s bill of lading: Please note the Bill To is not always the Consignee. Actual freight class if class 85 or lower. Multiple purchase orders shipped to the same location, on a given day, must be shipped on one Bill of Lading. A Bill of Lading that does not list carton count as the number of units will result in a chargeback. Pallet counts listed as units are not acceptable. Q: How can shippers access the same NMFC classes that the carriers use? Q: How can shipper contact the NMFC if they have questions on classes? Shipments ranging from 1-150 lbs. ship via UPS Ground. UPS Ground shipments must not exceed 20 cartons, regardless of weight. If dimensional weight is over 150 lbs., please refer to the instructions for shipments 151-9,999 lbs. Please make sure that “Urban Outfitters” and channel (Direct or Retail) is visible on all shipping documents. Shipments delivering to Gap, PA DC should be marked as collect. UPS account number can be requested from inboundrr@urbanout.com. When using UPS freight collect terms, all vendors are instructed NOT to insure the shipment. Vendors will be issued a chargeback for any insurance expenses that have been added to the freight invoice. Select your UPS account # from the “Associate a Shipper’s UPS Account #” drop down. Click the “Next” button located on the lower right hand of the screen to continue. Final destination DC as indicated on PO and packing list. Final destination is Gap Retail or Gap Fulfillment Center. 151 -9,999 lbs. OR Max 10 skids LTL Freight First: UPS FreightLTL Freight Second: YRC UPSF: (800) 333-7400 YRC: (800) 610-6500 Final destination DC as indicated on PO and packing list. 151 – 9,999 lbs. OR Max 10 skids LTL Freight First: UPS FreightLTL Freight Second: YRC UPSF: (800) 333-7400 YRC: (800) 610-6500 Final destination DC as indicated on PO and packing list. Be careful when using your browser’s “back” button, information entered may not be saved at all times. Please use RETURN TO MAIN MENU to start over. A vendor may schedule a pick up on the Performance Team website anytime in advance but no later than 1 day (24 hours) in advance. Click on “Pickup Scheduling”. Deliveries may be scheduled: you will simply put the word “Delivery” in the comment line of next menu. Note: All BOLD fields are mandatory entries. Use the “TAB” key on your keyboard or your mouse to move field to field. NOTE: There will be a small delay between entries- please be patient through the system processing. the details of the entry are validated by PT Customer Service, an email confirmation is sent. Failure to put “Delivery” in the comment line will result in a $75 charge if driver attempts to pick up and will be passed on to the Vendor. If the driver is pulled, a $75 charge will be assessed and passed on to the Vendor. Email: A valid email address is needed. Lift gate Req’d Bobtail Req’d, etc. You will be taken to the “Consignee” menu. You have two options here to select the proper Consignee which is the name of the Retail Customer you are shipping to (Urban Outfitters, Anthropologie, Free People etc.). Every PO along with the correct cartons, weight and cube must be entered. Each PO # and info is keyed one line at a time. Click on “Add” to actually add the PO line. All valid PO’s will be permitted entry or an “Error Message” will display. Cube: Enter the cube (cubic feet) for each PO here (if the entire shipment’s cube was not entered in the “Consignee” menu”). This is mandatory for proper load planning used by Dispatch and each Retailer to plan the number of trailers needed for pick up and load out. Measure the carton: length * width * height in inches. Divide that number by 1728 to convert to cubic feet. Multiply that # by the # of cartons with those dimensions to get “cube”. 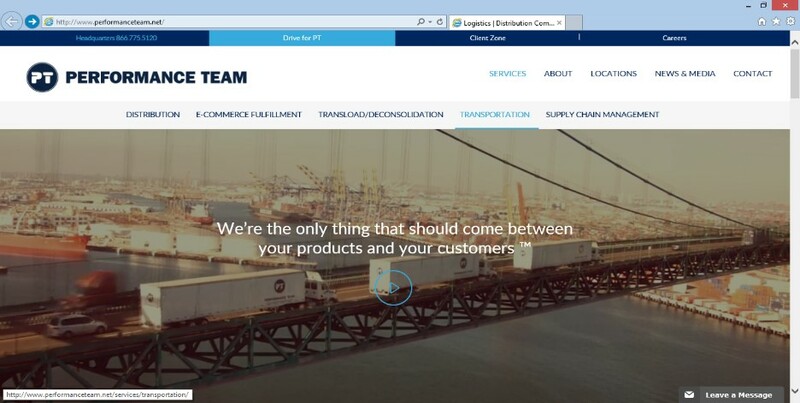 Note: There is a Cube Calculator on the web “Consignee” screen for Shippers Use. A full trailer = 3200 cube; anything more requires a separate pick up record. One standard 40” * 45” * 48” pallet is approximately 50 cube. Any PO Line may be Edited or Deleted by clicking on the correct button. Do not key any leading zero’s in your PO# when scheduling. There are 4 buttons to select. Notice the fields “Ctn/GOH”, “Weight”, and “Cube” contain the summed totals. Add = Proceed to finish entry in the “Pickup Details” screen. Cancel = Cancel PO entry and Start Over at “Pickup Details” page. Add/Update PO = Add more PO’s or Edit an existing PO entry. Show All = Permits user to see all PO entries but not Edit any. 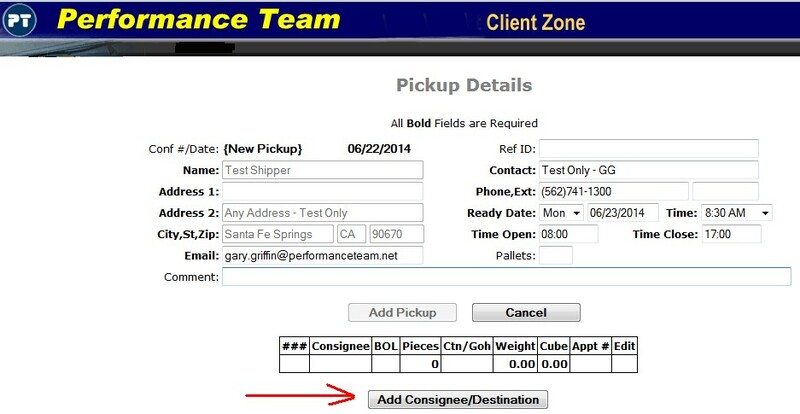 Click “Add Consignee/Destination” and repeat steps above for additional entry. A vendor may schedule a pick up on the Performance Team website anytime in advance of the pickup date but no later than 1 day (24 hours) in advance of the pickup date. LTL Non Blanket Wrap151-9,999 lbs LTL Freight First: UPS FreightLTL Freight Second: YRC UPSF: (800) 333-7400YRC: (800) 610-6500 Final destination DC as indicated on PO and packing list. These are shipments that are packaged, palletized, and shrink wrapped in a way that they can ship via standard LTL. Dropship Vendors will work directly with L&J Transportation Companies to book all pickups. Upon a Vendor completing the fabrication of dropship/made-to-order furniture items. The Vendor will be responsible to e-mail all pickup requests to L&J Transportation and URBN Inc.’s Transportation Department. Primary Contact Name, e-mail, & phone number that will be available the day of pickup. Any special instructions. e. add’l packing materials required, preferred pickup date/time, 53’ trailer required, crating required, etc. All requests MUST be accompanied with a completed ‘Ready for Pickup Request’ form. L&J will arrange for pickup and e-mail Vendor with booking details. Pickup date & four hour window. Any special or additional instructions. If Vendor needs to change or cancel the pickup date or time. It is the Vendor’s responsibility to notify L&J with no less than 24 hours’ notice. If L&J is unable to complete the pickup, they are responsible to immediately notify the Vendor, and manage the rescheduling of the pickup. Pickup Issues & Escalations: Any no shows, delays in communication, missing pickup details, etc., MUST be immediately escalated to URBN’s Transportation & Warehousing Management Team. Please use L&J and use shipping terms 3rd Party Collect billing to Urban Outfitters Inc. 755 Brackbill RD. Gap PA 17527. This must be written on the BOL to ensure it is billed to right account. Please ensure that each piece of the order is labeled with the order number, customer name, and order piece count. Upon a Vendor completing the fabrication of dropship/made-to-order furniture items. The Vendor will be responsible to e-mail shipment notifications to Metropolitan Warehousing & Delivery, and URBN Inc.’s Transportation Department. All notifications MUST be accompanied with a completed ‘Ready for Pickup Request’ form. Please use L&J and use shipping terms 3rd Party Collect billing to Urban Outfitters Inc. 755 Brackbill RD. Gap PA 17527. This must be written on the BOL to ensure it is billed to right account. Make sure the PO’s and buyers name appear on the BOL. Please ensure that each piece of the order is labeled with the PO number, Anthropologie Home Office, Buyer’s Name, and PO piece count. If shipment has a specific delivery date please reach out to DTC@urbn.com to obtain a Time Critical quote for the BOL. This should only be used if a specific date or time is needed. URBN Transportation will need to be notified the day and time the piece(s) need to deliver. Please contact L&J URBNFurniture@ljmoving.net. The below will need to be written on the BOL.